From Wikileaks to the iPhone 4G saga, no news organization has been as crucial to spreading understanding of American news to the masses than Taiwan’s NMA news. They’re the geniuses behind the recent craze of Sims-style computer animated news videos, and they’re one of the funniest news organizations around. 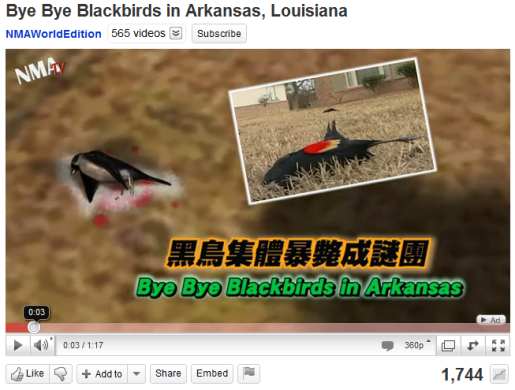 Finally, NMA News has gotten around to talking about the Arkansas bird die-off! If you think I haven’t been waiting eagerly for this moment since the first news of the Arkansas bird die-off broke, you’re crazy. I love NMA News and their insane versions of modern news stories. They’re like The Daily Show, but funnier. It doesn’t matter what story they cover, or how sick of the story I might be, once NMA gets involved, I’m all over it. I have to say, this is some of their best work. From the CSI cat to the military conspiracy canine in a helmet, this is some of their best work. Throwing in the Angry Birds reference was too brilliant. Leave it to NMA to make a story about massive trauma hilarious.